Dr. Kenneth B. Castleton's excellent directions to many Utah rock art locations were of inestimable value. Special thanks are due Dr. Richard W. Effland, Jr., Anthropologist in the Cultural Science Department, for his advice and encouragement and for posting these pages on the Mesa Community College server. Ken Costello and Robert R. Farwell provided assistance in the Media Center. The technicians in the Library and Computer Laboratory have always provided excellent help and are to be commended for their patience with us students. For the artwork, slides were projected onto 30" by 22" Rives watercolor paper and rendered with India ink to produce black and white drawings. Careful attention was taken to produce photorealistic images. These were commercially photo reduced to 8.5" by 11" paper, then the images were electronically acquired by a Hewlett Packard ScanJet 4C using Adobe Photoshop. The background images based on the artwork were colorized using Adobe Photoshop, most in duotone mode then changed to RGB mode to save as 72 dpi JPEG files. Some were exported as GIF files. On the Mesa Community College campus, all the scanning, computer work and page creation was accomplished using Power Macintosh computers (7600/132, 9600/233 and 6500/250) at Media Services, the Computer Laboratory and the Library Information Commons. The pages were created using Netscape Navigator Gold 3.0. In my own office I used a Mac IIfx, Adobe PageMill 2.0, Adobe Photoshop LE, Adobe SiteMill 2.0 and I edited HTML files as text documents with Microsoft Works 3.0 or BBEdit Lite. The original pages were created in 1997 and posted on the MCC server. I currently maintain the site with Dreamweaver. The entire site was edited and moved in July of 2000 to Geocities. In Nov. 2001 I moved the site to my new domain, jqjacobs.net, on a HostSave server. 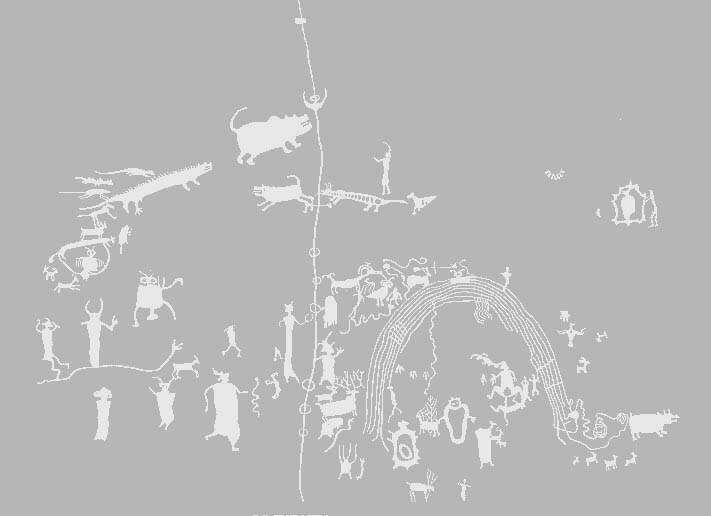 The Fremont Rock Art page was added in 2005 with images scanned on my new Nikon CoolScan. All images © 1997-2005 by James Q. Jacobs. All rights reserved. Users are welcome to copy the page background images and buttons linked below for personal use (ie. as desktop images.) The images can be used in personal, non-commercial web pages if you provide a link to the Rock Art Home Page or my Photography Page. Inquiries are welcomed. See the transparencies page for a listing of photo stock and sites studied. and offering free resources for educators and private users. Commercial inquiries, rights inquiries, and commissions are welcomed. desktop patterns may be used for free. Read my permissions details first. All rights reserved. Copyrighted 1997 by James Q. Jacobs.